What do the eyes tell the brain when sprinting at 40 km/hr? 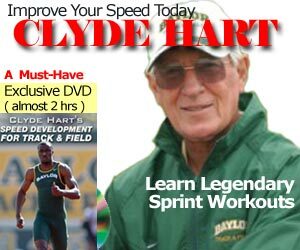 Why does sprinting indoor feel faster? Is it because of the tennis nets lining the inside of Lane 1? We are all taught to “stay low” at the start, but where are we supposed to look? In situations where sprinting athletes are accelerating from a static start, you are teaching them to keep their head in line with their spine. Depending on their acceleration power, you are having them focus on keeping their vision on a point on the track surface anywhere from three to ten meters ahead of their current position. I often tell athletes to imagine that we have strapped a laser pointer onto their forehead and a red dot should be visible on the track ahead of them.If their gaze and head position are too low, the laser dot will be right in front of their feet. If their vision and head come up too quickly, the laser dot will not even be visible on the track surface. As the athlete transitions up to top speed, between 30 and 60 meters, the laser dot will slowly move well ahead of their current position and off the track. For long periods of time throughout the year, I will train sprint athletes in indoor environments to escape the cold and inclement weather. However, I find it is easier to get them to adopt proper posture in outdoor training situations. With indoor facilities, athletes will often see a wall in front of them when performing sprint repetitions. Even if they are not in danger of colliding with the wall, athletes will still change their posture and mechanics in anticipation of stopping prematurely. The body will tend to ‘rear-up’, impacting proper acceleration and/or maximum velocity mechanics. When training outdoors, I find that athletes do not feel the same confinement issues and tend to run more freely. I attribute this tendency to the power of vision and gaze. Almost innately, our bodies respond to not only ‘where’ we look, but also ‘what’ we see and take the necessary steps to change our posture and mechanics to anticipate a potential course of action. Some athletes are more sensitive to these environmental issues and coaches need to be aware of the impact of facilities on visuomotor control and athletic performances. For runners who are performing over longer distances, I always emphasize the importance of training their gaze to track well ahead of their current position. In open areas, I would have them focus on the horizon. However, in more confined areas (i.e. track stadium, wooded trail), I would have them look as far as they could focusing on a point that sits roughly at the height of their head. Focusing your gaze on points that are in close proximity to your current position will result in greater stress and mental fatigue. Your running mechanics will also subtly suffer and you will find that you are less smooth with your running. When an athlete focuses on points in close proximity, their eye movements will tend to move quickly from one fixated location to another in numerous saccades. Vickers describes saccades as rapid eye movements that bring the point of maximal visual acuity onto the fovea so that it can be seen with clarity. When focusing or “fixating” on a point much further away, you will find that you will run more easily and freely, and feel as though you are being pulled toward that point. It is similar to the concept of not focusing too much on the finish line in a race. From a significant distance (i.e. greater than 50-100 meters), looking at the finish line may work. However, as you get closer to the finish line, it is better to focus beyond the finish line to elicit the best performance. Fixating your vision at the finish line may terminate your velocity prematurely. I do the opposite. I think focusing on the ground closer to you throughout the run will elicit better feedback. I do it base on where my feet are going. Even when one athlete is behind another, I teach them to focus on the feet versus the back of the athlete in front of them. Change the frame of reference to gauge speed for tracking purposes.